The Skatepark Of Tampa has been a for-skaters-by-skaters operation since 1993, when Brian Schaffer and a few friends moved into a warehouse and built a vert ramp for themselves. For the last 24 years, their city has also been the destination of an annual pilgrimage by the skateboard industry for Tampa Am and Tampa Pro, two of the most important contests in skateboarding. At the center of it all has been Brian Schaffer, making sure things happen and that the skaters and crowd are hyped. It’s the link between the two warehouses. It gives everybody a little breathing room with picnic tables and a little bit of shade. It’s a place for people to catch some sun and skate some concrete with pool coping. Nike had a Grant Taylor activation that they wanted to do. That led to half of the concrete courtyard you see now. Then Converse helped us do the second half. The courtyard was just redone. We just fixed a few things so if flows a little better. It brought the element of vert back to the Skatepark Of Tampa. 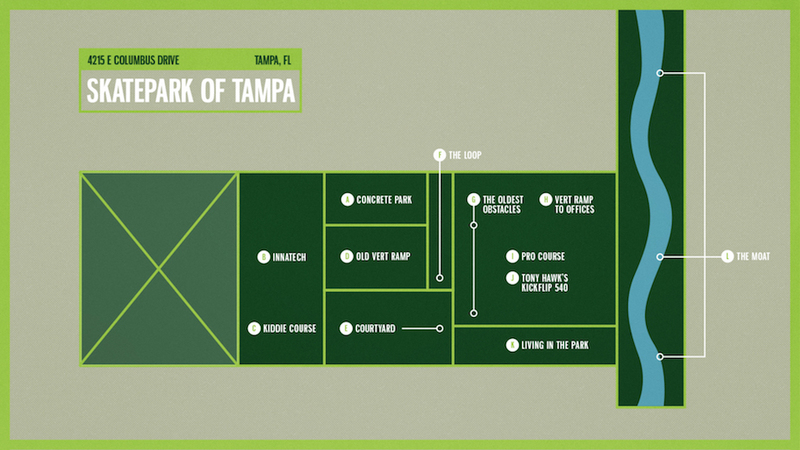 Jim Thiebaud has always had the Skatepark of Tampa’s back. He was like, “You guys should just build the loop and have a session on it.” Before you knew it, we had The Loop built in the courtyard. For me, as a vert skater, I was like “I can do that,” “I can land that,” “I’m sure I can just carve into it.” As the captain of the ship I gotta either sail or sink with it. I went for it. I warmed up dropping into The Loop. An hour into it—I call it the Lucky 13th try—I guess I looped out. I did a 1 ½ somersault in mid air in the middle of the loop. Luckily I came down on my shoulder and neck with all the weight on the upper body. I was knocked unconscious. I barely remember anything for the rest of the day or the next day after. Fortunately, I didn’t come out of it with any major permanent injuries other than a broken hand and a tore-up-feeling body. Two staples that don’t change year after year are the Roll In—we call it the Khunna—and the six-foot quarterpipe with the elbow in it. We don’t change them because that side of the course is the side that stays bigger and that creates a better flow for the centerpiece. Not only does it have a better flow for the skaters, it has a better flow for the spectators to see those opposite ends. Those two pieces just fit in those pockets better than anything else we’ve built over the years. That was the foundation of the skatepark. The concept came from the San Jose Skatepark: on my first trip to California, in 1992, Corey O’Brien, Simon Woodstock, and a whole bunch of dudes were living in a warehouse in San Jose. Here, when the park originally opened, we were moving into it. The retail shop was much smaller, so behind the shop, we just had a bunch of offices. There was always at least ten dirty dudes sleeping and living just behind the retail shop, within the park. Since 1994 we moved the vert ramp which opened up the course and made it ideal for a contest course. It’s just enough that it flows good enough. It’s not too long and not too wide. Through our sponsors, for the last ten years we’ve been able to really change the course. Probably 60% of the course changes year after year, just so we have a whole new vibe and when everybody comes to town it’s not just the same old thing. It changes; it flows; it keeps it progressive. The last year the vert ramp was inside was 2001. It used to be in the middle of the floor from ’93 to’94. From mid ’94 to ’01 it was in the back corner. Now, there’s just offices there. It’s all SPoT Events and Skatepark Of Tampa offices and storage for product. Tony Hawk came to Tampa to learn the kickflip 540. He never did it before and he came here. He worked on it for a day or two then he filmed it and nailed it. That was a moment in time for the skatepark. It was like, “The [expletive] Bird Man is coming to Florida to learn the kickflip 540! !” We were like, “[expletive] awesome!” It was just rad to have Tony here for a couple of days. He was friends with Mike Frazier and Paul Zitzer. He just came here to do the kickflip 540 for the first time ever in our little warehouse. Sal Barbier will claim that he started the moat—with a little bit of product and some pork ribs or something weird with food and product. That ended up turning into the Moat Product Toss which turned into The Moat Race. The Moat Race is just one of those random things. Kids are just stoked to get filthy and run through a dirty stream of water and risk getting hepatitis A, B, and C. Just for the free stuff, fame, and glory of winning the Moat Race at every Tampa Am and Tampa Pro. I think sometimes people skate that more than the Pro Course. It’s really great that we have so many areas that we can have elements of skateboarding. The kiddie course is just smaller banks, smaller quarterpipes, smaller hips, a simple manny pad, little hubba, and baby rail. We have a simple mini ramp that is four feet tall and 16 feet wide. Then we have one of our staples since we moved in the back warehouse, just have a rad five-foot bowl. It’s a kidney with a little hip in the middle.